Perfect to suit any type of room, whether big or small, a sectional sofa is a very innovative invention that took place way back during Victorian times when people invented the concept of this awesome furniture that could solve seating problems and looked great too. A sectional sofa, to many of us, represents longish looking couches that seem to gobble up half of the space in a living room. But, in reality, a sectional sofa has a lot more to it than just two or three couches attached together to lend it a bigger look, for example, there is a variety of sectional sofa pieces like recliner, love seat, chair, sofa bed and armchair. Come take a look as I list the top 15 sectional sofas for modern living rooms. The black leather sectional sofa seen anchored in this living room looks quite masculine and suits a bachelor pad like no other piece can. The shiny black leather upholstery makes the decor of the living area contemporary. The sectional sofa offers not just great looks, but is also very comfortable for resting and relaxing. 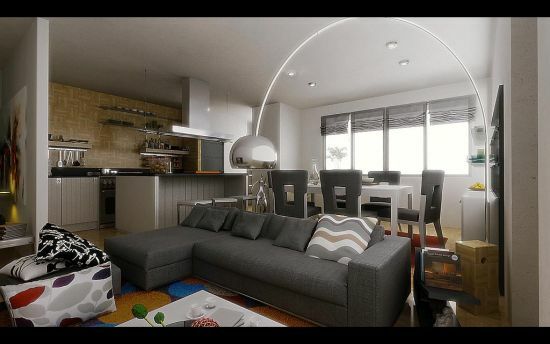 Its sleek size fits even a small living area and it matches with the black flooring. The white sectional sofa seen anchored in this brilliantly designed living room is upholstered using leather and looks very jazzy and elegant. 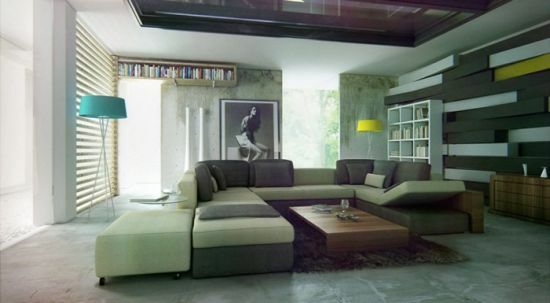 The make of the sectional sofa is such that it fits in this living room quite easily and saves space too. There is a chaise lounge at the end for offering an additional seating. Many sectional sofas like this come equipped with chaise lounges that are attached for comfy seating. The image below bears testimony to the fact that a sectional sofa can bring in large dozes of glamor to any setting in a house. 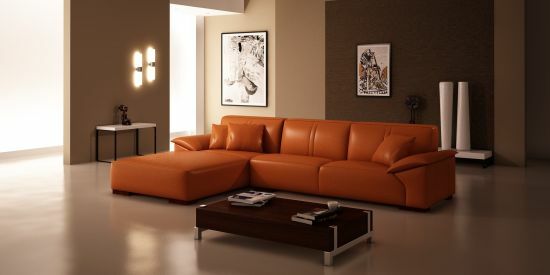 The large L shaped sectional sofa in orange looks eclectic with a very chic furnishing that lends it a sophisticated look. It comes equipped with a very comfortable and sassy looking chaise lounge, also in orange to provide for additional seating as well as for spreading legs for rest and relaxation. To live in a scintillating space as this one seems like a dream come true for most of us. Now, with many varieties of sectional sofa ideas knocking at your doorsteps these days, you can aspire to buy one that suits your decor. The white modern sectional sofa seen in the image looks dreamy and very chic with contemporary decor setting in this awesome living room with each and every accessory lined up to showcase the owner’s taste for beauty and elegance. The comfy looking sectional sofa offers extra space for seating guests and also comes equipped with an armrest at both the sides plus two console tables for keeping things. The modern living room in the image features a smart sectional sofa that looks stylish as well as is comfortable for relaxing after a hard day at the office. The soft white upholstery provides for comfy seating where one can rest his or her back on the soft cushions and back rest. If one has more than the required share of guests calling in, there are two chaise lounges attached together to offer more space. On the other end of the sofa, one can transform the seater and adjust it to be used as a recliner for resting his back. Modular sectional sofas imbibe such features that can be removed or added without creating any problems of seating. The white modular sectional sofa adorning the living room looks glamorous with a sleek design that makes sure you have no restrictions on moving around the space. If somehow, you feel that you can do away with the two white square ottomans placed next to the sectional sofa, it can be done quite easily without hampering the style or the utility. One can remove one or both these ottomans and place them separately or attach these to the sofa if more people are invited. 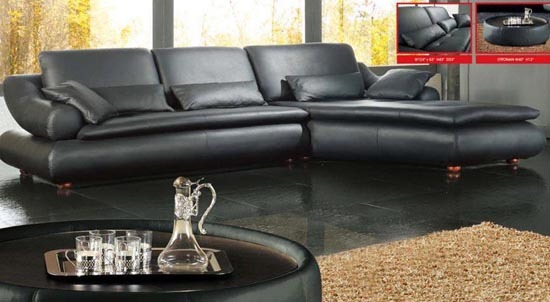 With a seamless built, the black bonded leather upholstered sectional sofa suits such rooms that have a space crunch. The sofa boasts of floating arm rests and comfy back rests that make it ideal for one to relax and chill. Supported by silver legs, the sectional sofa also features a plush looking chaise that can be reversed for other usages plus an ottoman in the same color. For such folks that like to sit and relax in style surrounded by plush decor, sectional sofa ideas might be of major help as these sofas can be used in number of ways and such pieces can be removed that aren’t in use. The modern grey two piece sectional sofa seen here has taken inspiration from modern sectional sofa ideas and is available with a chaise lounge that can be used for comfy resting. The plush backrest with cushions offers you a total relaxing time. Sectional sofa ideas like the one seen below serve many uses. Firstly, these can be utilized for regular sitting during the day. 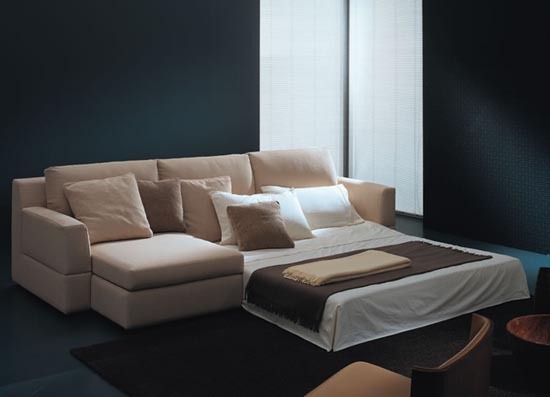 Secondly, the sectional sofa can be transformed instantly into a queen sized bed when you feel like dozing off. These types of furniture help in saving space and also offer additional room for accommodating guests. The sleeper sofa seen here is comfortable and can be used daily. 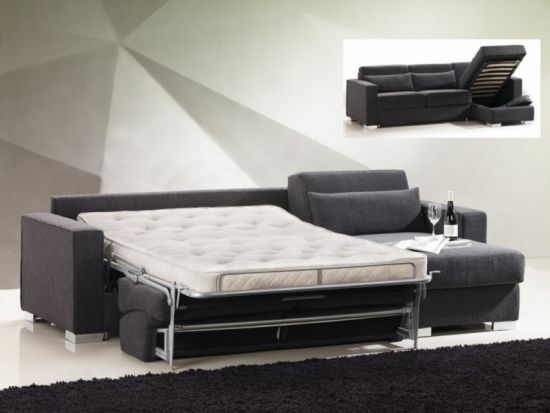 When not in use, the foldable bed can be inserted back in to the sectional sofa. These days, most folks designing their living rooms would never blink an eyelid to miss a chance to grab the best sectional sofa ideas such as the one seen below since these are in vogue and will never get out of fashion in the coming years. 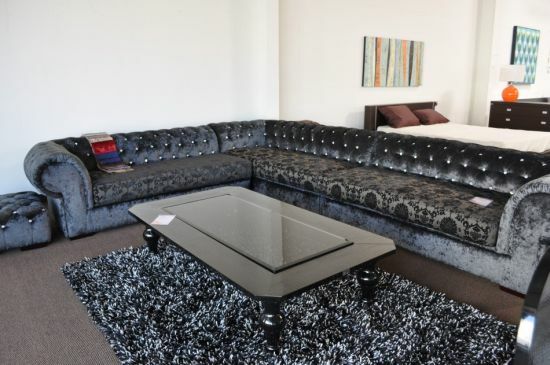 Seen in the image is a velvety textured sectional sofa that adds a zing factor to the decor of the living space as it is made of Leon fabric and is embedded with crystals. 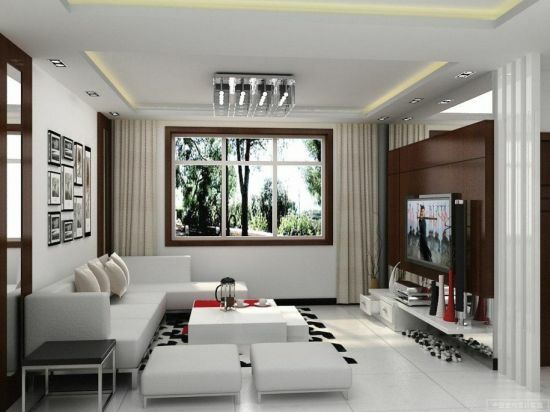 Such a piece is perfect to suit a lavish interior such as this one. The fabric is microfiber that lends it durability as well. Moreover, the light champagne color succeeds in mesmerizing all. It comes along with a chair and an ottoman, both of which enthrall you with their plush design and looks. 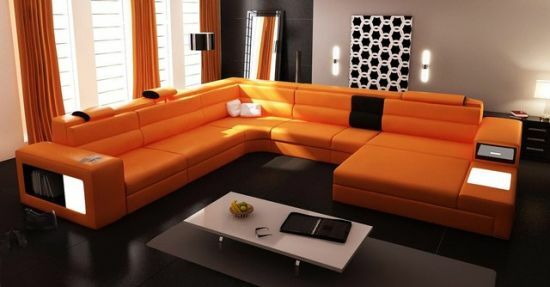 This particular sectional sofa gives you a jolt of brightness on first glance with its bright orange colored upholstery. 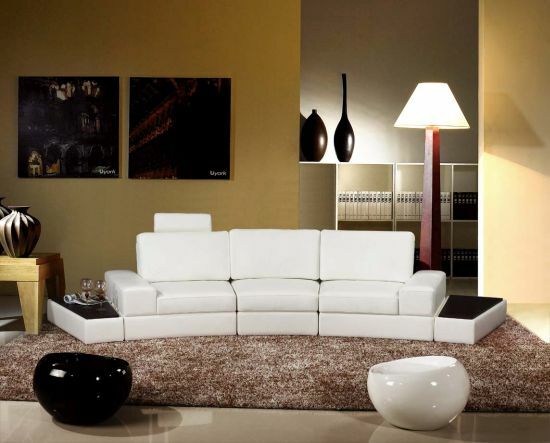 The sectional sofa is made of bonded leather and comes with two trendy lamps that are in built. The back and seats are made of durable foam that makes it resistant. The sectional sofa has headrests that can be adjusted to suit one’s comfort level. While the outer frame is made of leather, the inside of it is built of hardwood. With comfortable cushions to rest your back and head, the sofa steals the show as far as the decor is concerned. 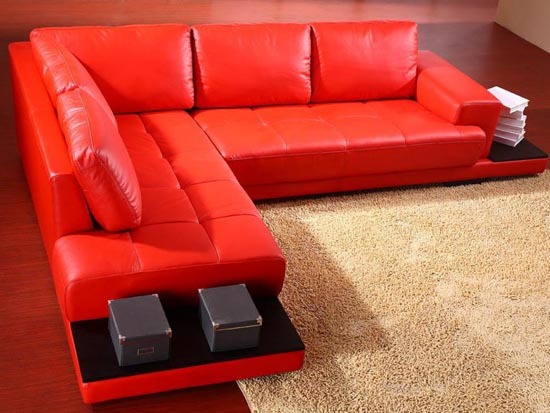 In the image is shown a very trendy looking sectional sofa in red color. The main frame is made of microfiber, a very durable material, while the outer frame is crafted using red leather that has a personality to it and makes the living area a vibrant place where one can entertain as well as rest. With plush and comfy back rest and mattress, this sectional sofa is among the best in this list of modern sectional sofa ideas. 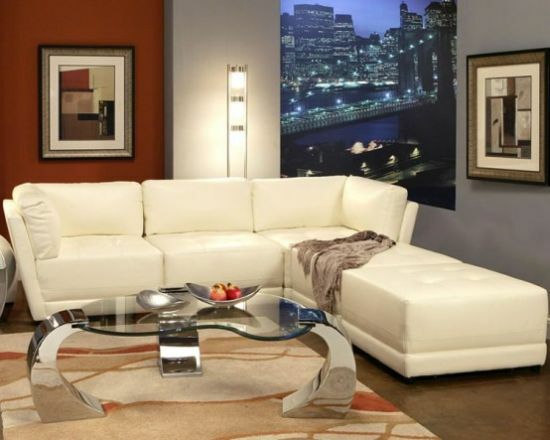 Moreover, the sectional sofa comes equipped with two low console tables or shelves attached for keeping things. The sectional sofa in the picture seen has a built in storage chaise that can be utilized for keeping a number of objects of daily use. Also, the sofa features a transitional sleeper queen sized bed with white upholstery to accommodate guests. The sleeper bed looks quite modern and fits inside the sofa quite easily. The fabric in grey looks pretty attractive and the chaise can be used as a console table if need be. Sectional sofa ideas of today have made it easy for us to style our living areas as per our whims and fancies. 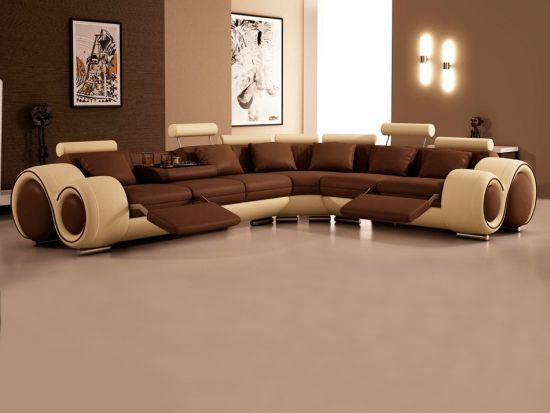 Seen below is a rich chocolaty brown and cream colored sectional sofa, a huge piece of furniture meant for large living spaces. The leather upholstered sectional sofa catches your attention with its attractive color combo and the two curvaceous armrests that steal the show. 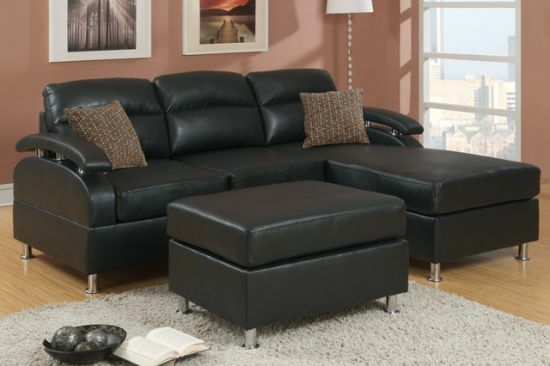 The sectional sofa has plush and comfy back rests with chunky cushions to rest your heads. These back rests can be adjusted and used as a table for keeping cups or other objects. Also, the two recliners look pretty comfortable for resting heads on the cream cylindrical head rests plastered on top. The silver legs of this spectacular sectional sofa lends to it more style and chicness. The sectional sofa in the image fits the concept of luxury living perfectly with Swarosky embellished fabric that makes it shine from various corners. It is quite large and is adorned with smooth And silken curves that make this piece of furniture stand apart from the rest of the sectional sofa ideas listed here. Its a three piece sectional sofa set that comes equipped with a lovely looking ottoman, also adorned with crystals that make up for a great accented living room. 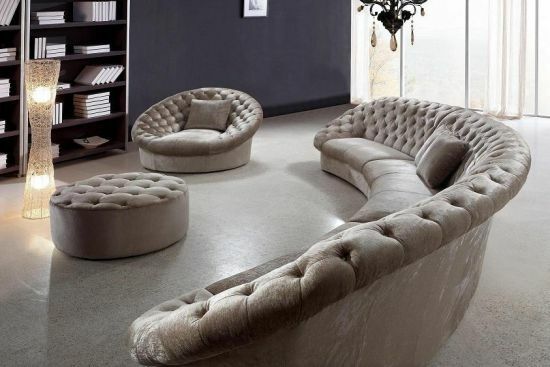 Made of grey colored suede fabric in two tones, the sectional sofa looks dazzling and quite unlike others. With comfy back rest, one can have a relaxing time sitting or even sleeping on it. Trendsetters in the world of interior designing, sectional sofas have revolutionized the contemporary living room decor ideas. Available in many designs and shapes, the sectional sofa is a quintessential decorative piece that has to be seen in your living spaces these days, without which your homes may look dull and drab. Many sectional sofa ideas imbibe cool curves or classic L shaped designs that seem to pep up the style quotient of your living quarters. Hence, if you are someone looking forward to add stylish accents to your living space, take inspiration from the cool sectional sofa ideas listed above and in no time you will see a marked change in the way your home looks! First of all thank you for the fantastic article. I am really impressed with one of the sofa beds which was the 9th category – Contemporary sectional sofa bed. Could you please advise where I could find this. Also, I am particularly looking out for sofa beds only so it would be of great help if you’ll could guide to an appropriate store in Bangalore if at all you know any. We are glad you liked our article, Sharath. We do not sell anything, only provide inspirational ideas.